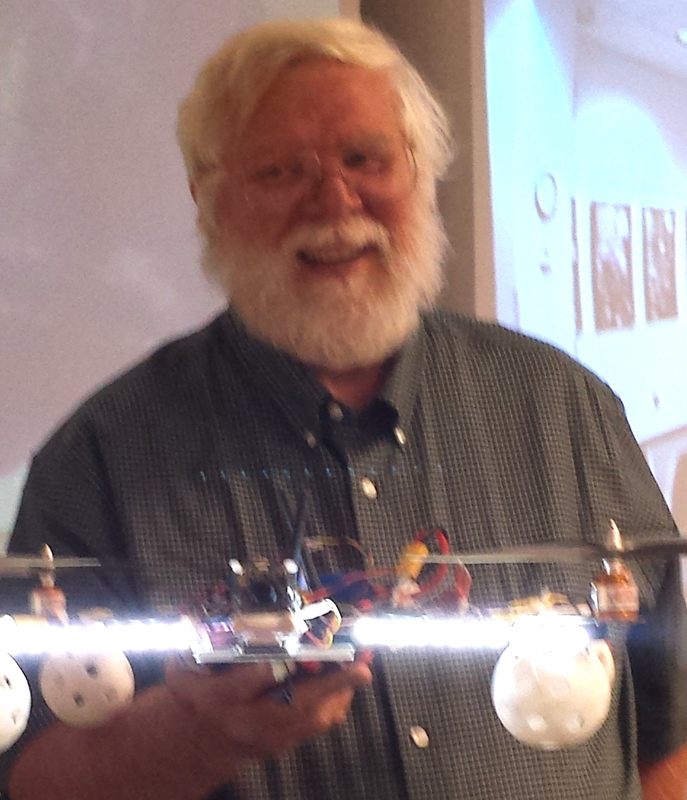 November Section Meeting: "HeliAcc Particle Accelerator "
December Workshop: "Hands-On Drones for Electrical Engineers "
Wednesday, November 12th, 2014 at 11:45 AM. Meeting: eLearning Course Power Quality, details at this link. Details: One Hour eLearning Seminar starting at 12:00. Please Register at the IEEE Madison Section events page . Abstract: This eLearning pre-recorded Seminar gives an overview of power quality with an emphasis on IEEE and IEC standards. Technical areas that are briefly covered include: voltage sags, grounding, harmonics, voltage flicker, and transients. Biography:Dr. S. Mark Halpin has been a driving force in the development of uniform power systems and power quality standards that promote worldwide reliability and safety. He has worked tirelessly to create international standards that advance the state of the art of power systems engineering. His work in both the IEEE Power Engineering and IEEE Industry Applications Societies resulted in the creation of nearly 40 IEEE power standards. Besides authoring or contributing to the IEEE Color Book series of power standard, he also initiated a major reorganization of the series, thus enhancing its usefulness to practicing engineers and engineering students. 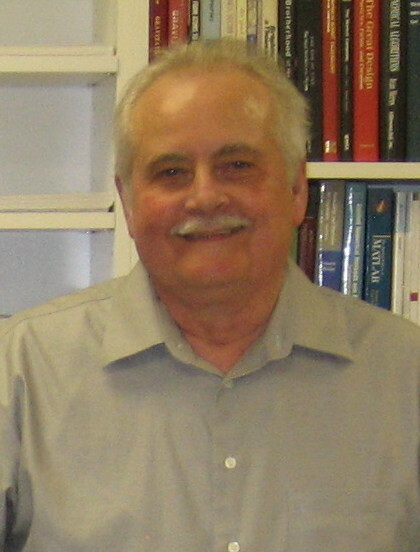 Dr. Halpin, who is the Alabama Power Company Distinguished Professor of Electrical and Computer Engineering at Auburn University in Auburn, Alabama, has made many other related contributions. These include pioneering methods for both power quality measurement and techniques to identify areas of bulk power transmission systems subject to voltage and angular stability problems. An IEEE Fellow, Dr. Halpin received the 1998 IEEE IAS Outstanding Young Member Award and an IEEE Third Millennium Medal. Speaker: Dennis Bahr, PhD, VP of R&D at HelionX, LLC. Details: Section Meeting Socialize starting at 11:30. Check for Parking Availability here. Talk: Dennis will talk about his company (HelionX, LLC) and the table top sized nuclear fusion reactor they are developing. The HeliAcc accelerator produces short high energy pulses of deuterons that are accelerated to a target producing a copious supply of pulsed neutrons. The HeliAcc accelerator can be used as one component of a neutron camera. Security screenings are done using neutron cameras since neutron beams will pass through container walls and highlight the materials inside such as drugs, plastic explosives, and nuclear material. Industry could use the camera to inspect critical items such as turbine blades and mortar shells. The pulses can be triggered on command allowing a neutron camera to take “pictures” even if the object is in motion, thus allowing for more rapid scanning and a higher throughput on production line operations. Current neutron generators use either radioactive materials or continuous flux accelerators for neutron production. 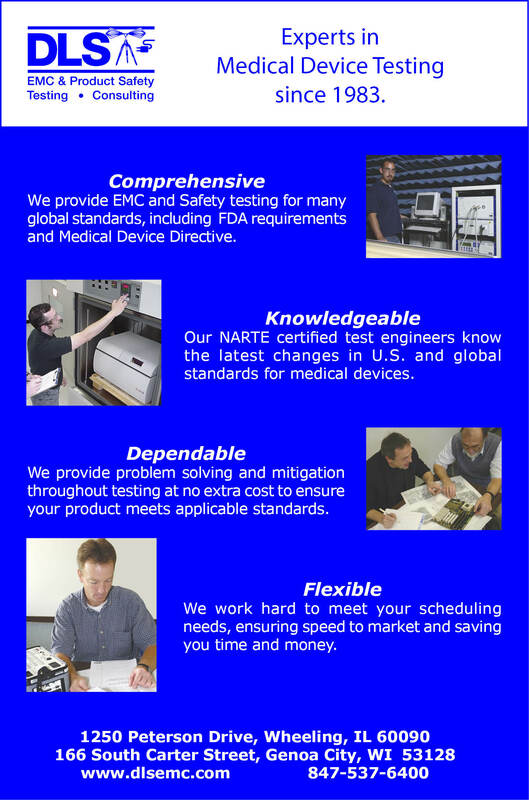 The use of radioactive materials requires specially trained and licensed technicians. Continuous flux accelerators are always producing neutrons when in use thus consuming large amounts of electrical power. The HeliAcc accelerator only generates significant energy when the pulses are produced. The design of our generator is such that it is inexpensive to manufacture and is light weight so that truly portable neutron source can be built. No radioactive material is used in the process and minimal nuclear waste is generated. When the unit is not producing neutrons it is not radioactive and is safe to handle. The unit is small (a few meters long), light weight (less than 250kg), and can be easily transported. Please Register at the Specific IEEE Madison Section event page . Workshop: Participants will learn about required components of Drones and work in small groups to build them, using hand tools for mechanical assembly, wiring, and soldering. The drones will be controlled with OpenPilot Atom and Revolution Flight Controllers, programmed with Open Source software through a groundstation. Participants will learn how to install, configure, and operate personal computer software used to program, configure, and tune the flight systems. By the end of the day, workshop participants will be able to fly their creations. The Drones built in the Workshop (or more technically, Unmanned Aeronautical Systems or UAVs) will be donated to the UW-Madison Student IEEE Branch for student projects. Advanced systems with cameras, GPS, on-board Linux microcontrollers will also be demonstrated. For more information on the OpenPilot Controllers, visit OpenPilot.org and for an overview of building drones in a student setting see this recorded video presentation at WN@TL recorded talk. It is time for the Annual IEEE-Madison Section Elections. This November, you will be receiving an e-mail ballot request. PLEASE do vote. To vote, you will have to login with your IEEE Member account. If you have not done so in a while, or have forgotten you password, you can get login information at this link. At this time, we have no candidates for Secretary -- if you are interested in running for the Secretary position, please contact Steve Schultheis via email at ss-at-ieee.org. Hidden Markov Chain Analysis: Dr. James Tripp presented a fascinating summary of modern Markov chain analyses to decode the chemical pathways for the SAR11 bacteria. Though not discovered until 1990, the SAR11 bacteria exceeds 30% of the bacterial count in the ocean and represents a mass equivalent to all species of fish in the ocean. His analysis helped to decode the function of this previously unknown organism. Dr. Tripp also spoke of his transformation from a database programmer to scientist at 50 years old, turning a lifelong interest into an exciting career. Magnetic Materials in Medicine: Dr. St. Pierre gave an excellent, well organized talk on new developments in magnetic materials used in medicine. He talked of both naturally occurring magnetic materials, such a iron in red blood cells, and of man-made additives, such as finely ground magnetic materials with drugs bonded to them. One interesting use of the materials is to identify sentinal lymph nodes to biopsy for breast cancer detection. Nano particles of iron are injected into the breast and flow though the lymph ducts to collect in the sentinel cells, allowing a simple magnetic field probe to locate the sentinel nodes for removal. It is safer and more accurate than using x-ray techniques. On a personal note, Tim had been traveling for three months as a Distinguished Lecturer when he arrived in Madison so when I proposed kayaking on Lake Wingra, he jumped at the chance. It was an enjoyable afternoon and Dr. St. Pierre was left with a good feeling about Madison. Blue Tooth Product Development: Bob Baddely gave a detailed talk on the steps he went through when developing the DigiTally product. It was quite informative and included an in depth discussion of eight or more types of technology that he explored on the way to the final solution. Bob's knowledge of problems in designing, fabricating, and certifying products with RF connections was useful to a number of the attendees. 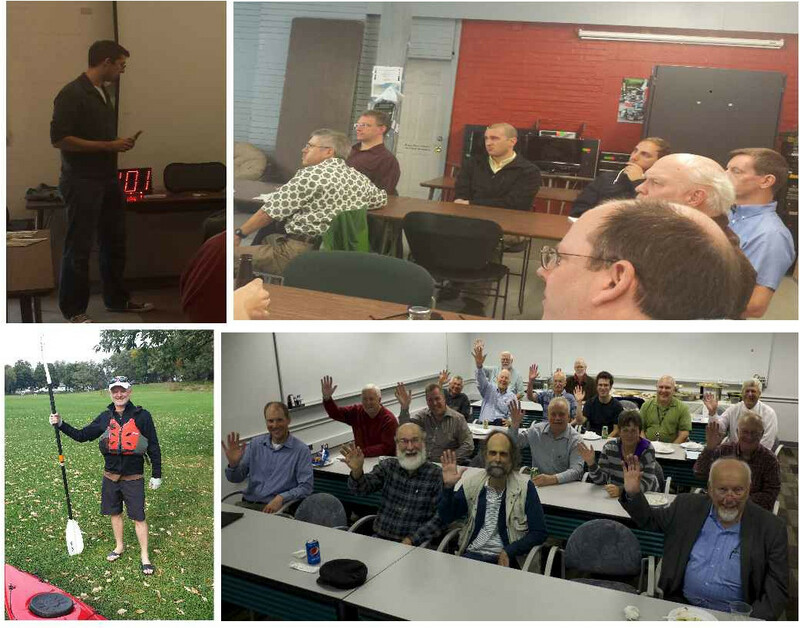 September also included an eLearning talk on LTE -- "Long Term Evolution" hosted at ACS, Inc. in Middleton. There was no eLearning talk in October, but we are back on schedule with a November talk on "Power Quality". In addition, both the September and October Section Meetings had heavy technical content and attendees got CEU/PDH credit for attending. The practice of awarding CEU/PDH credits for meetings will continue for both the eLearning and Section meetings in November. SLC: The UW-Madison IEEE Student Chapter has been selected to plan and host the 2015 Region 4 Student Leadership Conference on the weekend of February 7-8th, 2015. The conference organizers (students!) need sponsors to help pay for the event. If your company is interested in accessing the engineering leaders of tomorrow and supporting the IEEE, please get in touch with Maggie White, Student Conference Organizer via email at mawhite6-at-wisc.edu. Young Professionals: New Professional members of IEEE, previously called "GOLD" are now called Young Professionals and cover those who have graduated in the last 15 years. The IEEE-Madison Section now has over 140 members who are cosidered "Young Professionals". Are you interested in getting together with others to plan social, professional, job fair, and mentoring events? Would you like to help organize a Young Professionals Affinity group here in Madison? Please let me know (tjkaminski-at-ieee.org). Life Members: I have recently transitioned to "Life Member" (age over 65 and age+years-of-IEEE-service greater than 100), having been a member for 46 years -- no more dues and free Society publications! There are currently 67 Life (and Life Fellow) members of the Madison Section and all it takes is 6 members to petition the IEEE to form a Life Member Affinity group here in Madison with immediate financial benefit of $1000 for lunches, transportation services and other activities. Look for a solicitation email from me for those interested in helping start this affinity group. Scott Olsen joined the group Chair of Industrial Outreach. Scott is also a member of ASHRAE where he served as a Membership Development chair. Scott works at MG&E where he helps customers work toward efficient equipment, mostly in the HVAC and Building Controls areas. Scott is organizing a few hour IEEE-Madison event on Lighting Technology, possibly with a facilities tour. Ann Thompson has also joined the Executive Committee as Educational Activities Chair. Ann is co-lead instructor for the Electrical Engineering Technology Program at Madison College and was formerly Treasurer of Badgerbots. In addition to coaching a First Lego League team, Ann is the tournament organizer for the FLL event at Madison College, November 8th and 9th. She needs volunteer judges -- contact her at AEThompson2-at-madisoncollege.edu. Dennis Bahr agreed to Chair the IEEE-Madison EMB18 Engineers in Medicine and Biology Chapter. He plans to sponsor joint activities with the UW-Madison Bomedical Engineering Department. That department is growing rapidly and Dennis hopes to capitalize on its growth. The Institute of Electrical and Electronics Engineers or IEEE (read Eye-Triple-E) is an international non-profit, professional organization dedicated to advancing technology innovation and excellence for the betterment of humanity. IEEE and its members inspire a global community through IEEE's highly cited publications, conferences, technology standards, and professional and educational activities. It has the most members of any technical professional organization in the world, with more than 300,000 members in around 150 countries. The IEEE consists of 38 societies, organized around specialized technical fields, with more than 300 local organizations that hold regular meetings. Discover what IEEE Member Discounts can offer you. The Member Discounts portfolio consists of insurance products and programs for the home, office and travel, all at excellent group rates and reduced pricing. Visit IEEE Member Discounts to see what’s available in your location and enjoy the savings, For more information, please visit: IEEE.ORG. The IEEE-Madison Section has a number of volunteer positions open if you are interested in helping out. Please direct any questions or comments to Tom Kaminski via email to tjkaminski(at)ieee.org.